Hi! Thank you for everyone who visits my Tag It Wednesday posts. I would love to continue but for now I need to pause it as I'll be traveling for 3 weeks to Germany. I will begin Tag It Wednesday again in August. You can view my previous tags, tag entries and tag video/photo tutorials here. You'd like to join in my Tag in Wednesday, please subscribe to my blog (click the follow button my the sidebar) and you'll know as soon as I start Tag It Wednesday when I come back. I would love to giveaway a pack of some of my favourite tools for making a tag. I apologise for the late wrap up post because I was busy last week and couldn't get some photos up. I would love to share with you a tag for this post. 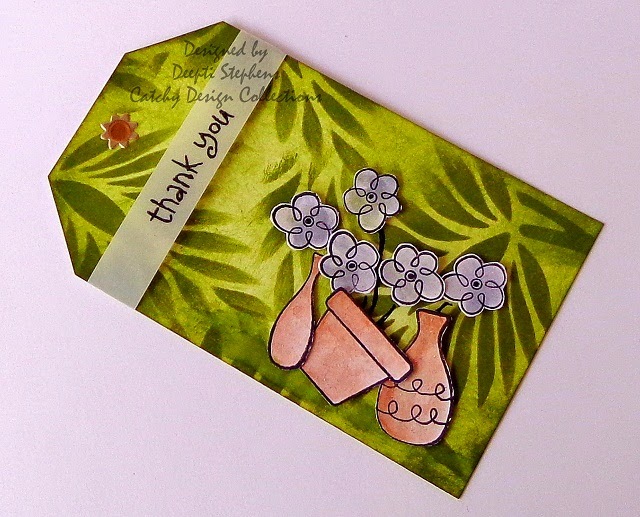 For this tag, I'm using Lindy's Stamp Gang's sprays and TCW stencils. The specific details of the products used are at the end of this post. I sprayed 4 different colours on a plastic so that I can dip my tag on it. Then, I mixed the Magical powders from Lindy's with texture paste. I have never done this before and I'm really happy with the results. I took the the coloured paste and use a TCW stencil with it. Finishing up with another awesome stencil by TCW, designed by Julie Balzer with just a plain white texture paste. The effects are so different when you mix the texture paste with some colours first or spray/paint it after that. Thank you to Deepti Stephens for submitting her beautiful tag during the last challenge. Gorgeous tag! love the textures!